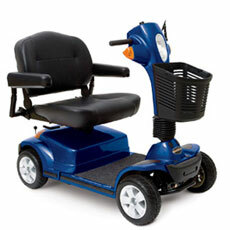 True heavy duty scooters offer generous seat widths and extra durability as well as higher speeds. A wide range of standard and optional features are available. Heavily padded seats, such as a captain's chair, are often standard and custom seats up to 24" and even 1 model with a 33" seat. While heavy-duty scooters can be disassembled, this is a cumbersome process for non-travel models and would not be practical on a frequent basis. Make sure the incline rating and ground clearance are adequate for how you plan to use your scooter. This information can be found on the specs tab of the product pages. SpinLife Knows: User weight will significantly impact distance per battery charge. Users weighing 350 pounds or more should select a scooter with at least 50 amp batteries to insure reasonable distance per charge.